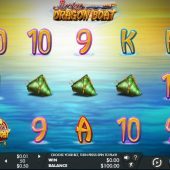 As the name suggests, Lucky Dragon Boat slot is an Oriental-themed slot with a nautical subject. With the plethora of games aimed at the Eastern player resulting now in a huge range of those slots being available, does Lucky Dragon Boat have anything new or different on offer? Well we have a pretty formulaic start with the Chinese pipe music and cymbals providing the soundtrack, but what lies beneath this water-going vessel? There are 5 reels over 3 rows and we have a typically large number of paylines, with 50 in total. The lucky Gold Coins are the Wilds and appear singly like all the other symbols on all 5 reels. They are the top pay at 15x bet for a 5-of-a-kind win. There are 3 different dragons plus a silk cushion which all pay 10x and we have the card icons in the form of letters paying 5 down to 1.5x stake for 5. This pretty much sums up the base game as there are no random in-play events, but we do have Lucky Dragon Boat Scatters on all reels. Three or more scatters will trigger 5, 8 or 12 free games for 3, 4 or 5 respectively. Before starting the spins you will choose one of the three Dragons red, green or blue. This becomes an extra Wild symbol and like the usual Wild it will become sticky for the duration of the free games when it appears. You cannot retrigger these spins though, which is a bit disappointing.